We provide official Car History Check & PPSR certificates with registration details, finance owing, stolen vehicle data & write-off history. QuickRevs offers fast search results with reports sent straight to you as soon as you complete payment. Get Car History Check reports to your phone and emails for your records. All data is generated from the Australian PPSR and NEVDIS databases and given to you in a report. You also get the official PPSR certificate provided by the AFSA. Built by Australian IT Professionals, the QuickRevs platform uses secure payment processes and we do not retain your payment details. Your email address won’t be shared. Get and compare the official description of the vehicle. This section of the car history report includes details on the type, make, model, year, engine number, etc. of the vehicle. Confirm the vehicle registration details. This includes the registration plate number, the state or territory in which it was registered, expiry date, etc. Details of any encumbrance, loans, or money owing on the car that’s registered with the PPSR. Don’t end up responsible for someone else debt by buying an encumbered car. Don’t be accused of receiving stolen property. Make sure the car isn’t one of the thousands stolen daily across Australia. The report will indicate if the car or engine was reported as stolen. Make an informed decision with full write-off details on statutory and repairable write-offs. Includes details on accidents, hail, flood, fire, collision damage, etc. Each report comes with an official PPSR Certificate from the ASFA that outlines all the details and which can be used to confirm your search results if you have an issue. Buying a second-hand car can be a tricky situation. Plus, it’s a significant investment. When you check the vehicle history, you are taking the right steps to secure your investment and time. A minute out of your day could save you thousands of dollars in repairs costs. Just a few seconds to request a report can ensure you don’t buy a stolen vehicle. A quick check online can prevent repossession of a car because the seller had loans outstanding. But, nothing can beat the peace of mind that comes from knowing you made the right decision. That you’ve completed a critical part of the vehicle inspection process just by running a search online. Let us help you get there. This is how you check vehicle history the right way. Take control of buying that used car. Get your car history report today the most affordable way. Who’s a car history check for? Avoid buying a lemon or swipe quick on a great deal with a fast vehicle history report. Make that sale faster by showing potential buyers the full worth of your used vehicle. Build trust with your customers by providing them with a detailed car history report. 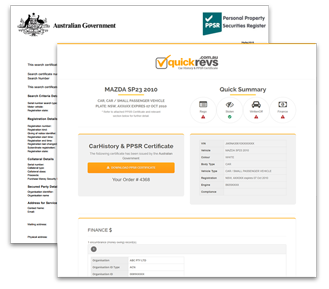 QuickRevs is a leading platform for car check reports in Australia. We help used car buyers and sellers just like you get a full car history report online at one of the best rates on the market. We understand why a car history report is important before you invest in a second-hand car. That’s why we make it easy to do the essential first part of the vehicle inspection process online. So, what can QuickRevs do for you? Car checks in Australia are easier with QuickRevs. We’ll help you make the right decisions for the big ones in your life. Order your QuickRevs Car History report Today. All You need is the VIN or Rego Number. Free vehicle check history by VIN number is not available anymore under the PPSR. But, you don’t have to pay a hefty amount to get a car history check done. So, while you can’t get a free car history check, you can get it cheap at QuickRevs. Looking for Car Inspection/Vehicle Inspection? In addition to your car history check report, you should get a physical vehicle inspection. Your online report is the starting point in researching the history of a second-hand car. Next is the physical car inspection which can help you detect anything that may have not made it into the online report as yet. Detailed car inspection reports are generally more expensive than a car history report. So, make sure you run the car history report first and get your PPSR certificate. Then, if all looks well, schedule a pre-purchase vehicle inspection so you don’t miss anything before the sale. Can I really research any vehicle within seconds? Yes, you certainly can do so at QuickRevs. Plus, it doesn’t matter if you’re searching for car history check NSW, car history check QLD, car history check free, and even car history check VIC. Our platform delivers reports almost instantly throughout Australia for a fast access to the information you need to make a decision now. So, check car history with the fast and affordable online search. It is the report that has helped many used car buyers across Australia make informed decisions. From finding a deal to avoiding making a costly mistake, a QuickRevs report is designed to offer the facts quickly and concisely. Plus, you’ll get an official government certificate from the PPSR as part of your report. How do I get my free car history check in Australia? Free car history reports aren’t so readily available anymore. And where they are offered, it means the critical details you need may not be included in the free car check. So, you’ll still have to pay to get the additional information, often at a higher cost. Or, you might go on a dubious site while trying to get a report with free car finance check. So, instead of wasting your time searching for a free vehicle history check or vehicle finance check free, just get your search over and done within no time at an affordable rate at QuickRevs. We offer vehicle check QLD, vehicle check SA, vehicle check VIC, and for any other state in Australia. How to check a car history? With either the VIN or the Rego number, you are one step closer to getting a reliable car check history report. Follow our three-step process, and you’ll have a report delivered in seconds to you. Just input the Vin/Rego number, click get car history report, and make your payment. Should I get a vehicle inspection? You should search for a car inspection service before you finalise your purchase of a used car. With a physical inspection, you can determine if there’s any general or mechanical issues with the vehicle. We recommend getting your online car history check first, and if there are no red flags, then proceed with paying for a physical vehicle inspection.